The establishment doctrines of Catholicism and the Reformation Movement have been the default positions for far too long! For centuries, literally billions have followed along blindly and suffered the consequences of their misinformed state. It's time to act! It is time for new leadership! 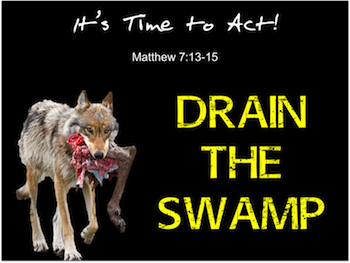 It is time to "drain the swamp" of self-important leaders and doctrines that tickle the ears! 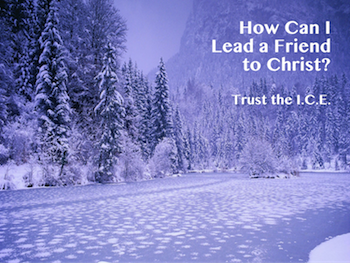 It is time to once again surrender control to the Holy Spirit's leadership of the church! While the cleansing process will not be pleasant, it is both urgent and necessary. The goal is simple - stop trusting men with the most important decision we will ever make. Return to independent Bible study. Depend upon the inspired Word to interpret the inspired Word. Accept the whole counsel of God and insist upon scriptural harmony before drawing any conclusions. The mind of God in written form has been provided, preserved, and published all around the world. It is time to drain the swamp of man-made doctrines and LET THE HOLY SPIRIT LEAD! The extreme irony of Reformed Theology is this, while Calvinists teach that humans are "totally depraved," they also rely heavily on human leaders to support that claim. In 1 John 4:1-5, the inspired writer records the following phrase in his instructions on how to identify false teachers, "They ...speak from the viewpoint of the world..." (NIV). Application: Beware of those who validate themselves by posting repeated quotes from Reformation leaders. It speaks volumes about the foundation of their faith. In truth, humanity IS depraved. We are a fallen creation and we cannot trust ourselves. We are desperate for leadership and we are totally dependent upon the promptings of God to find our way home (Acts 17:16-27). That is the very reason God gave us HIS exact instructions within Scripture! (Study 2 Timothy 2:15.) Warning! Whenever we neglect our own personal Bible study and default to the doctrines of men, we deny God's supremacy and elevate human wisdom to a place of idolatry. To say that man is totally depraved, yet has the capacity to direct a successful reformation movement is nothing less than humanism, heresy, and hypocrisy. It's time to expose the false teachers! "It's Time to Act! "3 - Doctrine of the Strait Gate"
Back to Top of "It's Time to Act!"